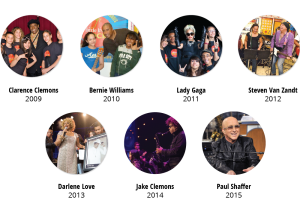 Meet some of the generous artists who strive to ensure that all children receive the transformational gift of music. 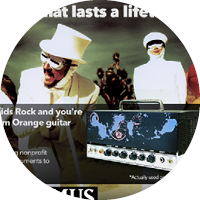 Santana and his Milagro foundation donated some of the first electric guitars ito Little Kids Rock back in 2001. 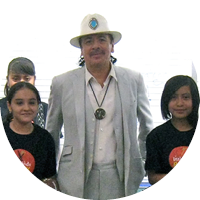 Since then, Santana has personally visited and jammed with our kids in San Francisco, Los Angeles and New York. James Hetfield is the lead singer and guitarist for Grammy-winning band Metallica. Metallica has received worldwide recognition and is widely regarded as one of the most progressive and influential rock bands of all time. Hetfield himself has received recognition as one of the greatest metal guitarists as well as one of the greatest metal vocalists of all time. In 2013, Hetfield was honored by Little Kids Rock at their Rockin’ the Bay Benefit in Menlo Park, CA. 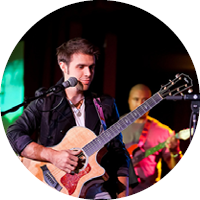 There, he performed on stage with local students and has filmed several PSA's and donated autographed guitars and other items to our auctions. Bonnie was one of Little Kids Rock's earliest supporters back when it was just a grassroots movement in the San Francisco Bay Area. Since that time, Bonnie has joined our Honorary Board Member, done meet and greets with students and donors, visited classrooms and invited Little Kids Rock to soundchecks and to host tables at her concerts. 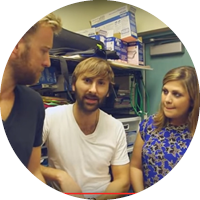 "We're not only talking about the future of music. We're talking about the future of our country." 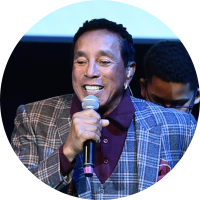 Once pronounced by Bob Dylan as America’s “greatest living poet,” acclaimed singer-songwriter Smokey Robinson’s career spans over four decades of hits. 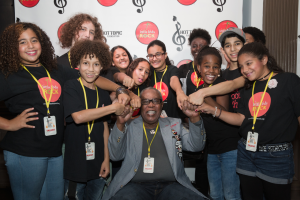 The Motown legend received Little Kids Rock's "Rocker of the Year Award" in 2016 and shared his passion for keeping music education in schools. 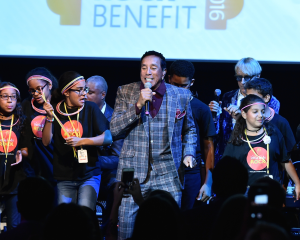 After joining a 12 year old student in a duet of "My Girl," Smokey performed "Get Ready," a hit he wrote for The Temptations, along with Little Kids Rock students from New York City and Philadelphia. 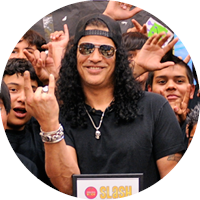 An honorary board member since 2009, Slash has inspired thousands of our students with his music, and an entire classroom full of students with his presence when he visted a school in Los Angeles and jammed with students on Sweet Child O' Mine. Slash has contributed various auction items to help Little Kids Rock raise funds, including autographed Gibson Les Paul guitars, which he is known for shredding. The Grammy Award Winning country group surprised a teacher in Miami by showing up with a classroom set of instruments and two free tickets to see the group perform. 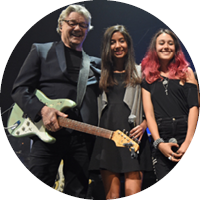 Steve Miller was honored as the Rocker of the Year at Little Kids Rock's 2015 Benefit in NYC. 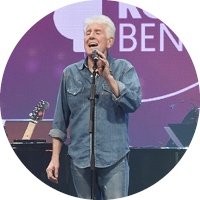 He performed a few of his hits, including "Fly Like An Eagle" with student vocalists, and even came back on stage to help auction off a guitar he signed. 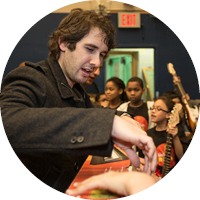 After supporting Little Kids Rock through his Find Your Light Foundation, Josh Groban made time to meet-and-greet with some students before a concert in Newark, and then gave the organization a shoutout from the Prudential Center stage. 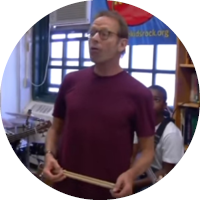 With the funds donated, he visited a school in lower Manhattan, jammed with the kids, spoke to them about his career, and delievered a bunch of brand new instruments. 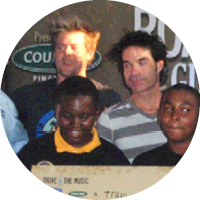 Racal Flatts surprised our students by delivering dozens of brand new instruments to a school in East Los Angeles. In partnership with CMA Foundation, the band presented a check to Little Kids Rock to help expand music education to even more students. The Insider and People Magazine came out to cover the visit, and the students, who jammed with Rascal Flatts on "Life Is A Highway" were thrilled to be featured on TV and in print! 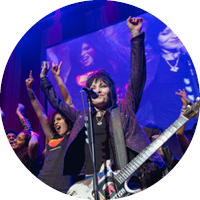 In 2014, Joan Jett was the honoree and headliner at the Little Kids Rock Benefit, which raised over a million dollars and attracted various luminaries including Alice Cooper, Billie Joe Armstrong, Cheap Trick, Tommy James, Ad-Rock, Darlene Love and others. Lady Gaga was Little Kids Rock's honoree at the 2011 Little Kids Rock Benefit. Her appearance at the event was a complete surprise to the hundreds of guests in attendance. Gaga gave a rousing speech, took photos with our kids, and donated various items to our auction, including a signed keyboard an her very own earrings! She even bid on and won one of the auction experiences herself. 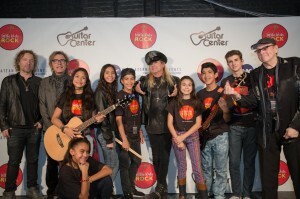 Steven Van Zandt has helped Little Kids Rock raise millions of dollars by producing and performing at several Little Kids Rock Benefits in NYC, procuring and directing artists including Bruce Springsteen, Joan Jett, Elvis Costello, Alice Cooper, Billie Joe Armstrong, Darlene Love, Brian Wilson, Cheap Trick, Bill Medley, Southside Johnny, Tommy James and many others. 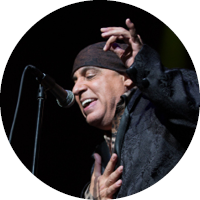 In addition, Little Kids Rock works closely with Van Zandt's Rock and Roll Forever Foundation to produce music curriculum that includes both music performance and history. 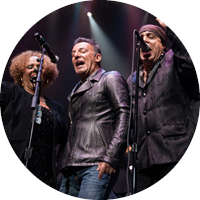 Bruce Springsteen surprised a huge crowd at the 2012 Little Kids Rock Benefit when he showed up to present an award to his friend and bandmate Steven Van Zandt. Bruce not only spoke, but also performed two songs onstage. 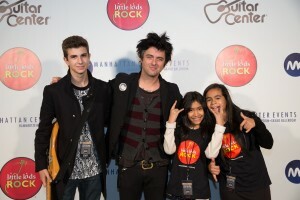 The Green Day frontman came out to help Little Kids Rock honor Joan Jett at the 2015 Little Kids Rock Benefit. 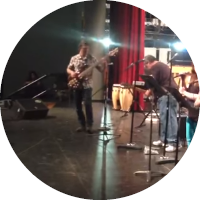 He performed on stage with Jett and then again with all of the evening's performers, including our own students! 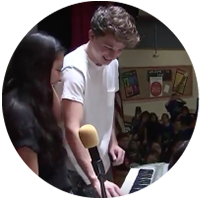 Pop star Charlie Puth took time from his national tour to surprise students at Cage Elementary in Houston, TX with a delivery of brand new instruments. He performed his song, "One Call Away" with students, answered questions, and took photos with them, giving the students an experience they'll never forget. 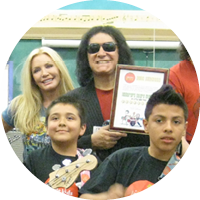 Gene Simmons and his family surprised a Little Kids Rock classroom in Los Angeles when they showed up to give a masterclass in music instruction and delivered tons of new instruments! The entire visit was featuerd on Simmons' national television show, Gene Simmons Family Jewels. The KISS star also has donated autographed memorabilia for Little Kids Rock to auction off at its fundraiser events. 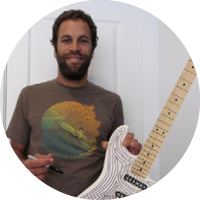 Jack Johnson's Ohana Charitable Foundation has funded Little Kids Rock's efforts to expand music education into inner city public schools. 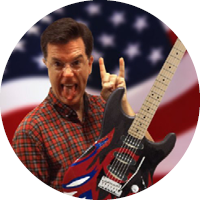 Personally, Johnson has autographed various guitars to be auctioned off by Little Kids Rock to raise more funding to support our work. 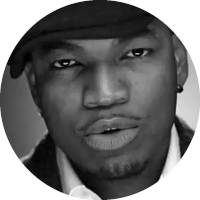 Ne-Yo filmed this awesome PSA for Little Kids Rock, sharing his story about the teacher who helped transform his life by introducing him to music, the way that so many Little Kids Rock teachers do. In efforts to provide percussion instruments to schools, RUSH created a premium Neil Peart Paragon Cymbal Pack, each of which came with a free splash cymbal personalized, autographed and dated by the RUSH drummer himself. 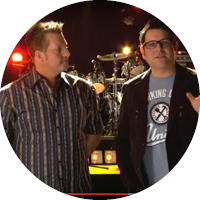 This cause-based marketing initiative went on to raise over $50,000 for Little Kids Rock. 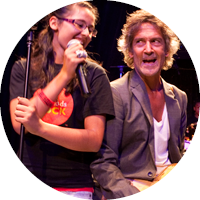 Nash was honored by Little Kids Rock as the Humanitarian of the Year in 2015, and performed "Teach Your Children" onstage with several local students. 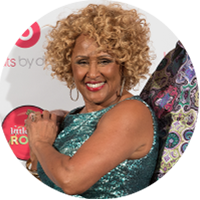 Darlene Love has supported Little Kids Rock for many years, having been honored at the organization's 2013 benefit event and having performed at several others, including the annual "A Souled Out Christmas" show in Red Bank, NJ. She also visited a school in Jersey City to deliver dozens of brand new instruments and sing “Lean on Me” with the students and the mayor! 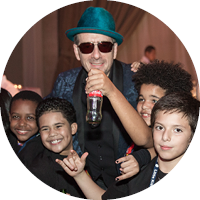 Elvis Costello has performed at two Little Kids Rock Benefits to help honor both Steven Van Zandt and Darlene Love. Furthermore, he autographed several instruments so that Little Kids Rock could auction them off to raise more funds to buy brand new instruments for kids in need. 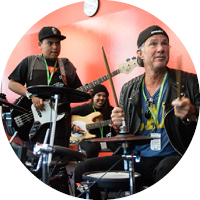 Chad Smith is a staunch supporter of music education, having worked with NAMM, Turnaround Arts and Little Kids Rock to ensure that all kids have access to music education. 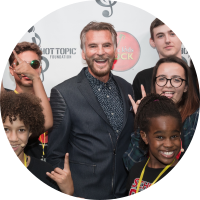 After having gone on the Dr. Phil show with some of our kids in LA, Smith joined Little Kids Rock Facebook's HQ in Menlo Park, CA to be honored at our West Coast Family Jam Benefit, where he jammed with our students and did several interviews about the importance of music education. 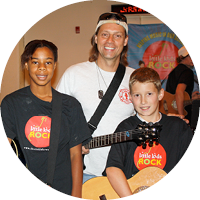 “I’m thrilled to receive the Humanitarian Award from Little Kids Rock. Every child should experience the healing power of music. 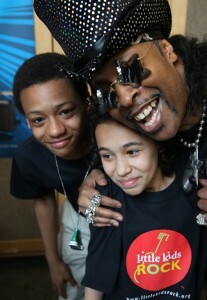 I’m really proud and honored to be a part of the Little Kids Rock family. The “Footloose” and "Danger Zone" singer/songwriter was honored with Little Kids Rock's "Humanitarian of the Year Award" for his decades of commitment to children’s causes, including his work with the Children’s Miracle Network and Why Hunger, and his involvement in the 1985 landmark charity single “We Are the World.” He performed his hit song "Footloose" with Little Kids Rock students and shared his strong feelings about keeping music alive in our schools. 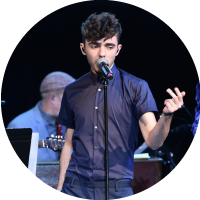 The English singer/songwriter, who came to fame with the band The Wanted, joined a star-studded lineup of musicians paying tribute to Smokey Robinson at the 2016 Little Kids Rock Benefit and performed Robinson's "Who's Lovin' You." 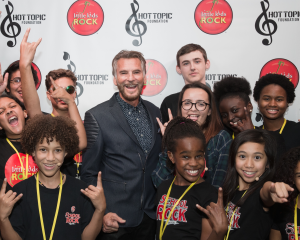 Sykes, who has already inspired Little Kids Rock students across the nation as evidenced by his band's popular song "Glad You Came," dropped his debut solo album the following week. The a capella star joined local students on stage at the 2015 Little Kids Rock Benefit and captivated an audience of 700 just weeks before making GRAMMY history with Pentatonix. 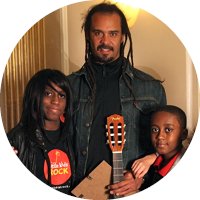 Michael Franti painted a custom Fender (R) Stratocaster (R) for Little Kids Rock's custom guitar auction in 2010. He also met with Little Kids Rock students prior to one of his shows in New Jersey, and invited one of the 12-year old girls to open his concert with an original song! Cheap Trick flew out to New York to help Little Kids Rock honor Joan Jett at the annual Little Kids Rock Benefit in 2014. The band opened the concert with an incredible rendition of Jett's song, "I Hate Myself For Loving You." 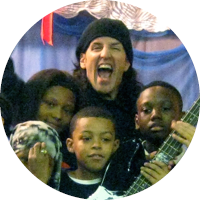 Joe Satriani has been on Little Kids Rock's honorary board for many years, having visited several schools and raised money through various auctions along his tours. 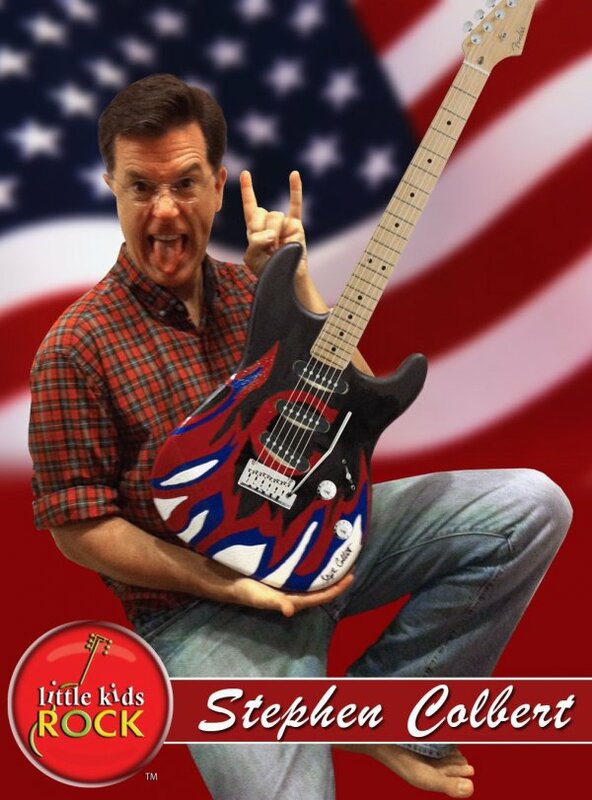 Stephen Colbert painted this custom Fender (R) Stratocaster (R) for Little Kids Rock's custom guitar auction in which various celebrities from both the music and entertainment industries painted or decorated one-of-a-kind guitars. 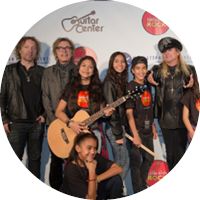 Sammy Hagar has supported our work by coming out to one of our events at Facebook's Menlo Park, CA headquarters, where he performed on stage with our kids and donated autographed memorabilia to our auction. 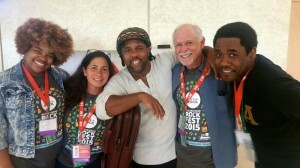 The legendary bassist, whose philosophy of music is very much in line with that of Little Kids Rock, has not only visited students in a Little Kids Rock classroom, but was also the keynote speaker at our national Modern Band Rockfest conference for teachers. 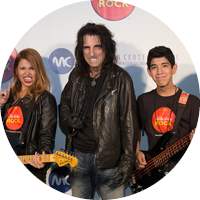 Alice Cooper came out to help Little Kids Rock honor Joan Jett at the 2015 Little Kids Rock Benefit. He performed on stage with Jett, helped us present an award to her, and then performed again with all of the evening's performers, including our own students! 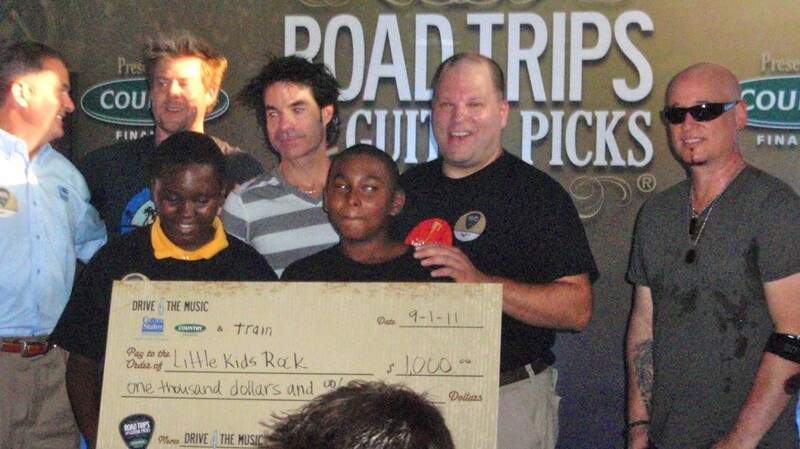 Both Train and Little Kids Rock participated on COUNTRY Financial's Road Trips and Guitar Picks campaign, which raised funds to help Little Kids Rock expand its free music programming to more schools. Before a concert in Alpharetta, GA, the band met with and sang “Hey Soul Sister” with a some Little Kids Rock students from Atlanta. 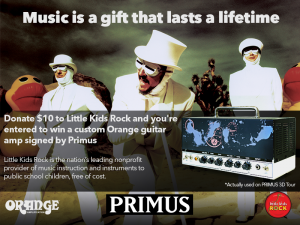 Primus featured Little Kids Rock as a beneficiary of its 2014 summer tour raffle, which gave fans the chance to support Little Kids Rock while entering for a chance to win a custom Orange Amplifier signed by the band. 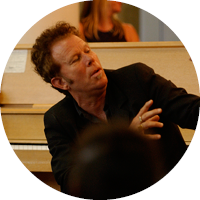 Tom Waits helped put Little Kids Rock on the news back in 2002 when he visited an elementary school classroom with Bonnie Raitt, Jason Newsted and Norton Buffalo. The former American Idol runnerup surprised an entire school full of children when he appeared in their classroom and sang along with them while CNN filmed a segment. It was not only these kids' first time meeting an American Idol, but also a role model whose music they were familiar with. It was also these kids' first time on TV! 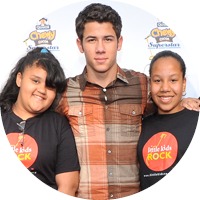 Nick Jonas was the celebrity partner for the Quaker Chewy Superstar Search, a campaign that benefitted Little Kids Rock and gave kids all across the country the chance to submit a video of themselves singing for a chance to win a record contract and be produced by Jonas himself! 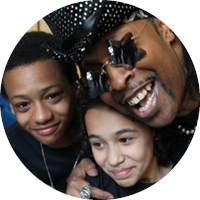 Bootsy Collins busted out his legendary space bass and the funky basslines to go with it when he visited a middle school in Jersey City. He jammed with the students, did lots of Q and A, and gave them a lesson that James Brown gave to him: "As long as you play on the one, you can do anything else in between... but always play on the one!" 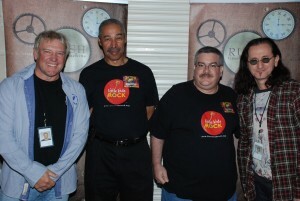 The former New York Yankees outfielder and GRAMMY nominated guitarist was honored at Little Kids Rock's 2010 benefit event. 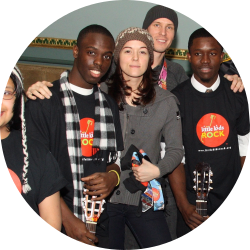 With the funds raised during that event, Williams visited a Little Kids Rock classroom in the Bronx and delivered a dozen guitars! Casadee Pope has been supporting Little Kids Rock since early in her career, urging her fans to donate to help other budding musicians have the same opportunites she did. She also helped raise funds for Little Kids Rock at a weeklong fundraiser at the Hard Rock Hotel and Resort in Cancun. 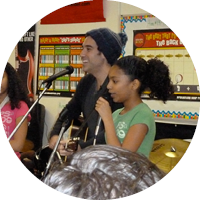 Joshua Radin has visited several Little Kids Rock classrooms all over the United States, teaching then to play his songs and then inviting kdis onstage with him at his concert later that night. He also filmed a music video to his song Beatiful Day with students from Los Angeles. 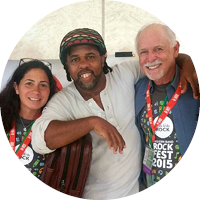 A former teacher, Radin understands the importance of music education and has even done benefit shows to raise money to support Little Kids Rock's work. 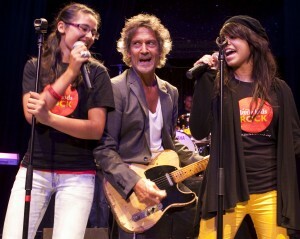 Billy Squier performed with a group of Jersey City students at Little Kids Rock's 2011 benefit event, and signed his guitar afterward to be auctioned off. Leading up to the concert, Squier visited the students at their school to work with them and prepare them for their biggest performance to date! 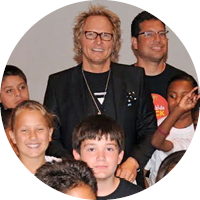 The Guns N' Roses drummer has visited several Little Kids Rock schools, performed with Sammy Hagar at a benefit event, and partnered his Adopt The Arts organization with Little Kids Rock, resulting in a tremendous pyramid of guitars being donated to schools throughout Los Angeles. 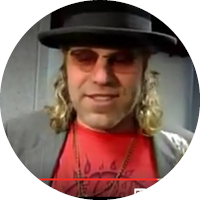 Big Kenny, country music star and half of the Big & Rich duo, visited a Nashville classroom and brought a dozen Guild acoustic guitars to donate to the class. 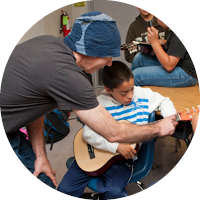 As he said to the class, he believes that all children have the right to bear musical instruments! Country music rising star, Clare Dunn, made a special tour stop at Mt. View Elementary School in Nashville, TN to deliver brand-new acoustic guitars, entertain and visit with students. The students were ecstatic to perform "Brown Eyed Girl" with Dunn, and she shared that it was the first song she ever learned to play. 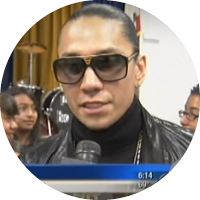 The Black Eyed Peas vocalist surprised an entire school in East Los Angeles to when he showed up to deliver a dozen electric guitars and perform "I Got A Feelin" with students at their end-of-year school concert. He followed up in in-school performance with another one at Facebook HQ in Menlo Park, CA, where he took the stage with kids from San Francisco. 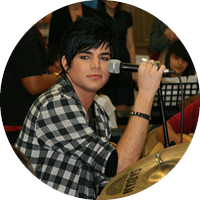 Later, he took elementary school students into a recording studio to record an original song that he wrote. 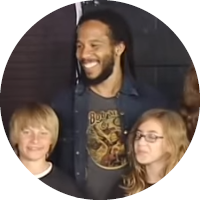 Ziggy Marley has been an Honorary Board Member of Little Kids Rock since he visited a school in LA in 2008, where he jammed with an auditorium filled with students! He then filmed a PSA and met with some of our San Francisco students before one of his concerts. 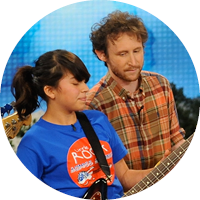 The Incubus lead guitarist performed live with Little Kids Rock students on the Dr. Phil Show in 2009, and even gave them a few pointers! 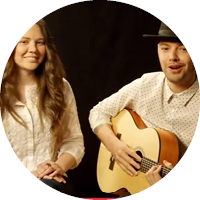 Jesse and Joy visited a classroom in Los Angeles along with State Farm Latino, who was running a fundraiser campaign for Little Kids Rock that unlocked another second of an unreleased song by the singer songwriter duo every time someone used the hashtag #RitmoDeCambio. They taught the kids to perform one of their songs, and then filmed a music video with them to help promote the campaign and raise more funds to help Little Kids Rock put music into classrooms across the country! Brandi Carlile did a backstage meet-and-greet with some high school students in New Jersey, and it turned into an all out jam session! 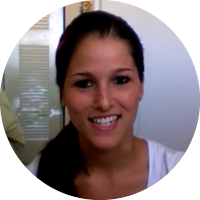 Afterward, she filmed this public service announcement about how important music education is for kids. 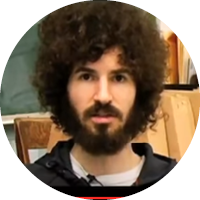 The Linkin Park guitarist visited a high school in Los Angeles, and filmed a PSA to promote his support of Little Kids Rock. Country singer, Wynonna Judd, selected Little Kids Rock as her charity of choice to help her and City National Bank rename the San Jose Civic Center. Little Kids Rock students performed, and she joined them for a rendition of her song, “Love Can Build A Bridge” before unveiling the new marquee. She also helped present Little Kids Rock rock a check for $5,000 to expand music programming for local students in San Jose. Orianthi met with and inspired a group of high school students who got to take their first ever trip to the NAMM Show in Anaheim. 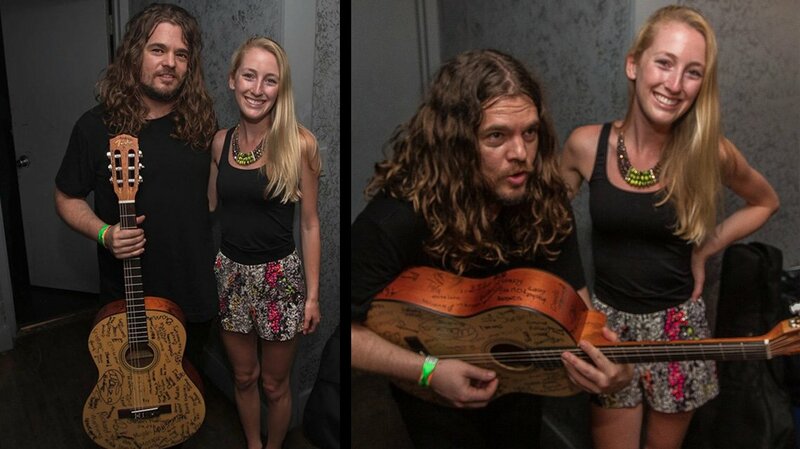 There, they presented her with a guitar that they all signed and got time to ask the young Australian shredder lots of questions. 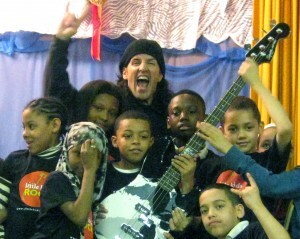 The Anthrax bassist visited an elementary school in the Bronx and donated some of his custom signature bass guitars. He spoke to the kids about the importance of making music, saying no to drugs, and being all around positive people. The Dave Matthews Band bassist has been a member of Little Kids Rock's honorary board since 2010, and stopped by our annual Dallas Jam Summit to give the students a special experience, which included a jam session on his tour bus as well as on stage, where he presented a dozen new guitars to the district. 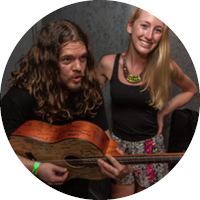 In Tampa, he invited a group of our students backstage to meet the various people involved in a concert setup, from the lighting guy, to the sound engineers, to Dave Matthews himself. After coming to an event and meeting our kids, KoRn's guitarist got his whole band involved by particpating in an online raffle in which the winner would get to go on tour with the band and ride on their bus! They filmed promo videos and promoted the raffle on social media, raising tens of thousands of dollars for Little Kids Rock. 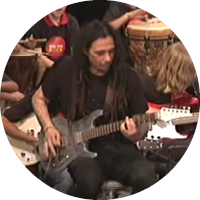 Munky also helped us deliver a bunch of instruments to a school in LA and helped the Hot Topic Foundation announce a huge donation to Little Kids Rock. 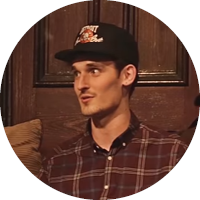 The Detroit-based DJ hosted a series of micro-events as part of his 10 GRiZ-mas, helping to raise awareness and funds amongst his loyal fans. 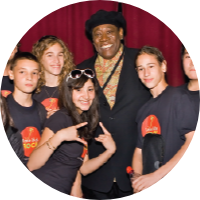 The Season 8 American Idol winner was honored at the 2010 Little Kids Rock Benefit, where he performed "Imagine" with Bernie Williams, Carmine Appice and our kids. 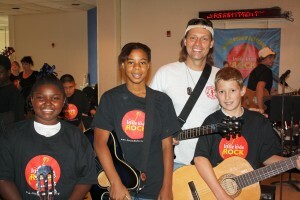 Allen first saw Little Kids Rock in action when he visited a “Little Kids Rock Across America” Modern Band workshop in Los Angeles with Dr. Phil, and has since come out to perform at various Little Kids Rock events. 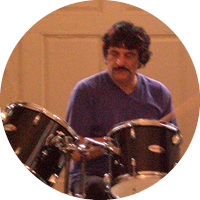 DeVitto had a 30-year career as the drummer in Billy Joel's band, and though he has traveled the world and helped create some of rock and roll's most iconic songs, he has never forgotten his roots. 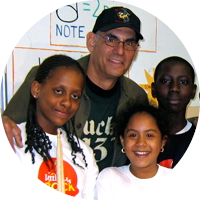 Ever since Little Kids Rock moved its headquarters to New Jersey, DeVitto has been very involved in the organization's growth, helping film drum curriculum videos, visiting schools to give masterclasses and performing at our benefit events. 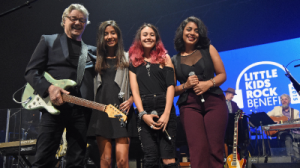 The legendary drummer of Vanilla Fudge and Cactus fame has been a Little Kids Rock supporter for over a decade, having visited schools, filmed PSA's, performed at fundraisers and even served as a guest judge and speaker at other Little Kids Rock events. 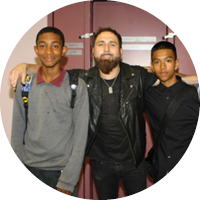 Monte Pittman made his name as a guitar teacher for the stars, and has since been the primary guitar player for Madonna, Adam Lambert, Prong and others. 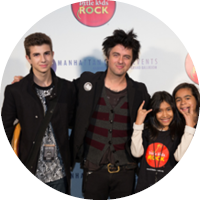 He joined Little Kids Rock's Honorary Board after visiting a school in LA and falling in love with our program. Pittman has also raised funds for Little Kids Rock through an online crowdfunding campaign, filmed a PSA, donated auction memorabilia and even served as the keynote speaker for the middle school he went to visit on its graduation day! In 2015, Tommy Trash was booked to headline the annual BeachGlow Music Festival in Atlantic City, NJ. However, the event was cancelled due to extreme weather. Tommy Trash teamed up with BeachGlow and made sure Little Kids Rock's kids still came out on top, helping to launch music programs in 19 Philadelphia-area schools, bringing music education to up to 4,000 kids! Simon Kirke is known for being the drummer for bands Free and Bad Company. 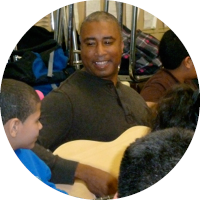 He brought his talents and storied career to a school in the Bronx to jam with the students and answer their questions. Rich Eckhardt has been a staple in the country music scene, most notably for playing guitar for Toby Keith. In addition to traveling around the country and inspiring students by visiting their classrooms, he has also hosted entire classes of students backstage at Toby Keith concerts. Legendary saxophonist Clarence Clemons was a big man, with an even bigger heart. He stood up for kids everywhere, regardless of their economic status. One issue that was dear to Clarence was keeping music alive in our nation’s most economically challenged public schools and he was a vocal advocate who gave generously of his time. 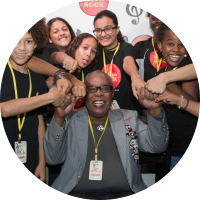 From 2009 to 2015, Little Kids Rock proudly honored Clarence’s legacy by bestowing the “Big Man of the Year” award to a musical luminary or philanthropist whose contributions embody these same values. The inaugural award was given to its namesake, Clarence Clemons himself. Les Paul was an American jazz, country and blues guitarist, songwriter, luthier and inventor. He was one of the pioneers of rock and roll and is credited with inventing the solid body electric guitar, and popularizing recording innovations including overdubbing (also known as sound on sound). 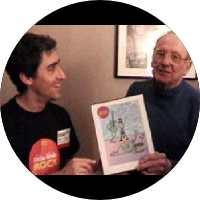 He was also a member of Little Kids Rock’s honorary board of directors, and his legacy of impacting music for the next generation lives on through the Les Paul Foundation's support. Little Kids Rock was proud to count B.B. King as an honorary member of our board of directors. 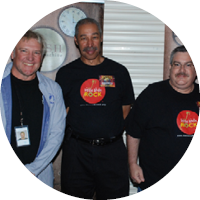 The blues legend has been a proponent of Little Kids Rock since 2002 when Little Kids Rock incorporated. 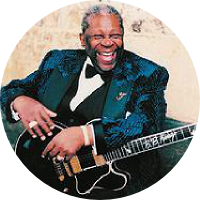 He was a blues legend and a man whose music has inspired future generations of music makers, including the kids who we serve today.